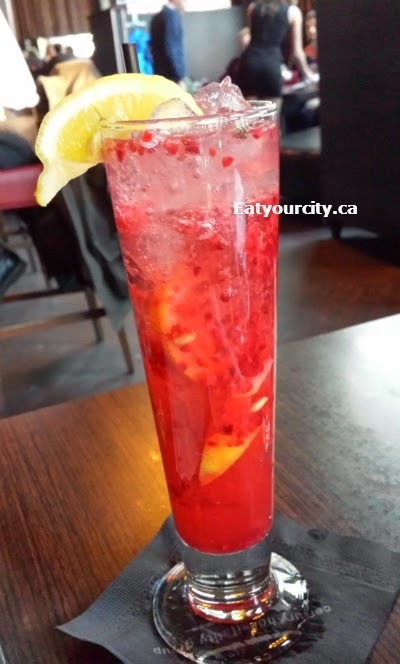 Posted by A few months back during Downtown Dining Week, we hit up Hundred Bar and Grill Edmonton to grab a quick bite of dinner. Parking as usual downtown is slim with the seemingly endless bits of construction, so head a little bit early before your reservation time so you can factor in parking and hiking to the restaurant time. The place is bustling with folks getting off work and heading to this open dining area decked out in dark woods, red seating couches to lounge on.. on to the food! We start out with a few drinks - my boyfriend went with a tasty Raspberry Lemonade made with Absolut Raspberri vodka, smashed raspberries, and lemonade. It was light and refreshing without the alcohol overwhelming the fruit flavors. Me and H both had the Forbidden Fruits - Bombay Sapphire gin, smashed fresh blueberries, raspberries and strawberries, fresh citrus, simple syrup, topped with ginger ale. The hit of alcohol was quite strong and we didn't taste much of the fruit... pretty drink though! We started with the Delux Sliders - Bite sized Snake River Farms Wagyu beef burgers, lettuce, tomato, chipotle mayo, on mini Kaisers. While tasty, the burgers could have used a bit of fresh herbs to kick things up as the burgers were a touch on the gamey side. As part of the downtown dining week menu, as part of the downtown dining menu, me and H also had a creamy pureed potato soup... can't quite remember what it had in it, but it was hearty and delicious. 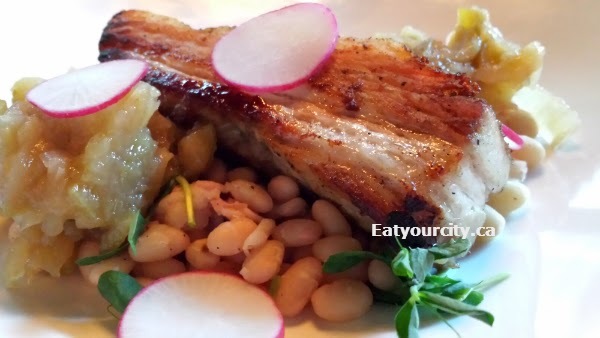 The Roasted pork belly with apple relish and navy beans was delightful. The pork belly was like a big thick slab of rich fatty bacon, mellowed out with the sweet apple relish. It was only missing a crispy skin and it would have been heaven... hope they put it on their regular menu! We had the flat iron steak served atop some roasted veggies and tasty potatoes. As it was cooked flat iron style, could only get it medium rare (as it would have been tough as heck otherwise due to the cut of meat) - for those wondering why my steak isn't the usual blue rare! My boyfriend was really craving a burger, so he had The Burger -house ground Heritage Angus Beef chuck & brisket, Oka cheese, tomato jam, onion ring, fresh arugula, toasted bun with a side of Caesar salad. It was unfortunately on the dry side despite the tasty toppings, but he made quick work of it anyways as he was hungry and really craving a burger, any burger lol! As our drinks doubled as desserts and took up tummy space, we shared the panna cotta that came with the downtown dining week special. 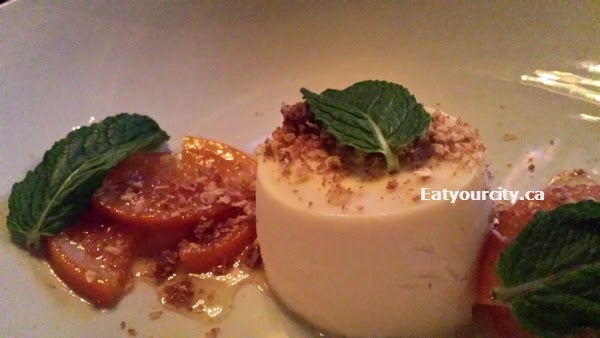 While the flavors were excellent, there was too much gelatin added to the panna cotta - I had to slice it with a knife. Overall, a decent place to stop off for drinks and share tapas, or sharing plates and have a drink with friends after work. The entrees was a bit hit and miss, but we'll likely be back to try more of their sharing menu items next time.